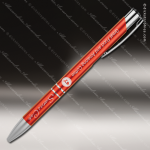 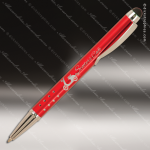 These ballpoint pens are available in a variety of colors and feature a click top, glossy finish with silver trim and black ink. They can be personalized for a special event, as a gift, or with your company logo for an incentive or promotional item. These ballpoint pens are available in a variety of colors and feature a click top, glossy finish with silver trim and black ink. An added feature of this pen is the rubber grippers that make it more comfortable to use. The pens can be personalized for your special event, as a gift, or with your company logo for a great incentive or promotional item.